The Sonos PLAY:5 Wireless HiFi Player offers an impressive range of sound through its five integrated speakers. Control your music wirelessly using the app. Sonos PLAY:5 is the original, bigger-room, bigger-sound, all-in-one Sonos player. It's a powerhouse of sound with five integrated speakers and five digital amps. Stream all the music on earth wirelessly in any room and control it all with free apps for your Android® device, iPhone® or iPad®. 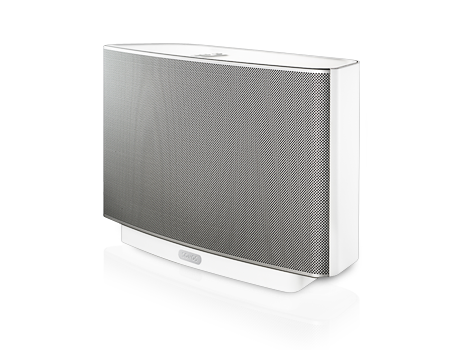 SONOS HI-FI SOUND. Five integrated speakers powered by five dedicated digital amplifiers (two tweeters, two mid-range drivers, and one subwoofer driver) provide crystal-clear, room-filling sound that rivals much larger, more complicated audio equipment. ALL-DIGITAL SOUND. The all-digital sound architecture provides precise sound reproduction, just as the artist intended. All filter settings, active equalization, and time-alignment are done in the digital domain so there's no loss of audio quality or energy. STEREO PAIR FOR BIGGER SOUND. Turn two PLAY:5s into separate left- and right-channel speakers for even bigger stereo sound in one room. STREAM ALL THE MUSIC ON EARTH. Enjoy a universe of music everyday – your iTunes® library, your favorite music services, and more than 100,000 free Internet radio stations, shows, and podcasts. Music service availability varies by region. CONTROL YOUR WAY. Search, browse, and play your music with the dedicated Sonos CONTROL or free Sonos Controller Apps for your Android device, iPhone, iPod® touch, or iPad.